1. Copper Cherry – Canadian brand of handmade canvas and leather outdoor and travel goods, by Jessica Nepton-Chayer. These bags bring a sense of adventure. Find her bags, backpacks, and travel goods both weekends at the Royal Bison! 2. Give them an adventure greeting card by Homework Press! Find all genres of letterpress greetings and paper-goods both weekends Nov 30 – Dec 2 & Dec 7-9. 3. Edmonton artist Stephanie Simpson is back again with new prints over both weekends. She will have her natural park prints as well as a new Edmonton map! 4. Smithstine Copper – Mountains, skylines, river paths, coordinates – you name it! Kristine will be back both weekends with new copper jewelry designs and new enamel pendants! 5. Jim Shoots Film – Capturing Edmonton and beyond through film (yes, film!). Find Jim's striking photographs both weekends at the Royal Bison. 6. Local family business, Field Work creates high quality handmade goods for the outdoors using traditional materials such as vegetable tanned leather and water resistant waxed canvas. Find their camera straps, wallets, and other goods over the Nov 30 – Dec 2 weekend! 7. Edmonton sisters of Hundr Vidar will be bringing unisex clothing, backpacks, and accessories. Rad! Find them both weekends! 1. New vendor Jenny Liski of Scout Paper Goods has beautiful cards, prints, and enamel pins, inspired by exploring the Rocky Mountains. Find her work over the Nov 30 - Dec 2 weekend! 2. 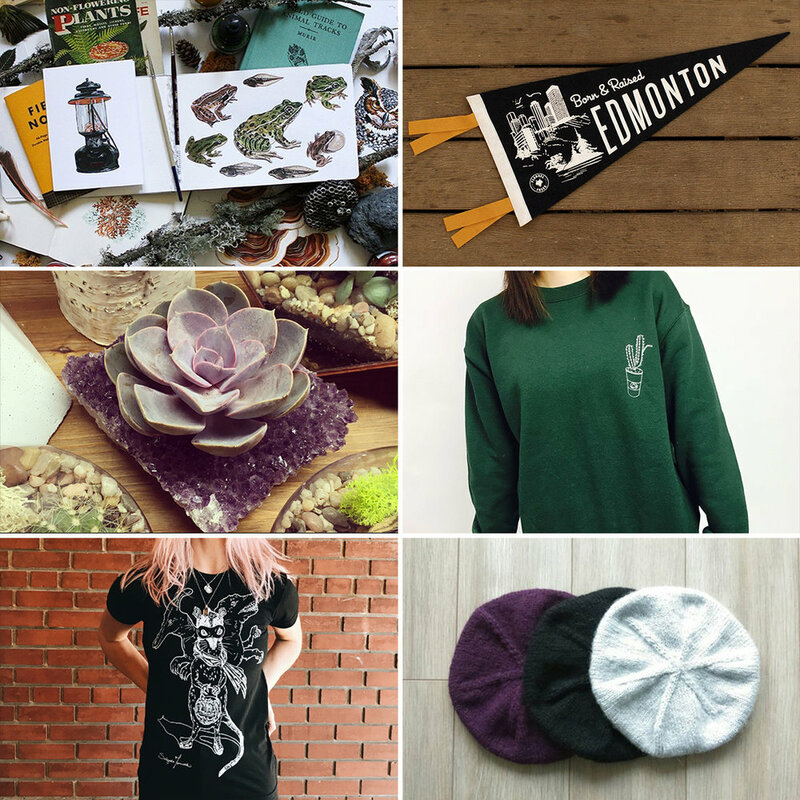 Committed to ethically made, socially conscious goods, Flannel Foxes will once again bring nostalgia and Western Canadian lifestyle products to the Royal Bison both weekends! 3. Bring nature inside with Edmonton's houseplant boutique! They told us they always save their quirkiest, one of a kind plant pots for the Royal Bison! Little Plant Shop will be vending Nov 30 – Dec 2! 4. New vendor, industrial designer and illustrator, Peaches of Life is Peachy, will be at the Royal Bison for the Nov 30 – Dec 2 weekend! Just look at this cactus sweater! 5. Salgado Fenwick – Made with love, featuring lots of neat animal drawings and screen printed in small batches, find their unique wearable art during both weekends of the Royal Bison! 6. Go Gidget Go will be back once again with their modern handmade knitwear accessories to stay cozy outside - find their knitted goods both weekends this holiday! 1. From Harper – This Canadian brand focuses on quality, style, and as well as fit. Find cute patterns both weekends Nov 30 – Dec 2 & Dec 7-9! 2. Papercut Monsters – Designer Joel Kadziolka, will be bringing his collage monsters to both weekends of the Royal Bison. These monsters are loved by all ages, from toddlers to adults! 3. New Saskatoon vendor, Very Happy Toys, makes all of their products by hand. They are sewn to last, and made to play. Find their puppets and toys during the Nov 30 – Dec 2 weekend! 4. 559 Toys brings handmade developmental toys for infants with over the Dec 7-9 weekend! 5. Mountains and Monsters – Adopt a carefully designed, handmade plush toy, from the Canadian Rockies! Find your mountain or monster Dec 7-9! 6. Local artist, Yu-Chen Tseng, is back and she will be bringing her beautiful watercolour artwork. Find her over the Dec 7-9 weekend! 1. Biblio-Bison – Find Edmonton's premier literary publishers and writers both weekends at the Royal Bison! Browse through their collection of local books, magazines, and learn about cool literature events happening in the city! 2. Local writer, artist, zine-creator Matt Prins will be back for both weekends of the Royal Bison with his very special reads. 3. Reading a good book requires a pair of warm socks! Calgary-based sock company, Friday Socks, brings Canadian-designed / Italian-made socks to the Royal Bison Nov 30 – Dec 2! 4. The Exit Workshop – These beautiful wool blankets will keep you warm over the holidays! Find their headwear, scarves, and other products during the Nov 30 – Dec 2 weekend! 5. Zine Machine – Can't get enough of zines? We know we can't! Find the zine distro during the Dec 7 - 9 weekend - feed it a loonie, and the Zine Machine will feed you a zine! 1. New Edmonton Fiber Artist, Curious Fox Fibres, will be bringing unique wall hangings and punch needle pillows to the Royal Bison Nov 30 – Dec 2! 2. Ryspot – Edmonton's one-man concrete designer, Ryan Spotowski, will be bringing a collection of new items both weekends, including this wild concrete clock! 3. Blending mid-century design and pop culture, Sam Knopp creates functional ceramics that are playful, minimal, and richly tactile. Find Sam's beautiful products during the Dec 7-9 weekend! 4. Committing to make yarn produced in Alberta, for the people of Alberta, Alberta Yarn Project will do just that by selling their yarns and knitting kits during both weekends! 5. Jovi Klak – New vendor and Edmonton-based artist will be bringing her colourful patterns and hand painted mandalas Nov 30 – Dec 2! 1. Adrian Martinus – These Calgary based brothers work primarily with rescued and reclaimed wood to create unique goods for the kitchen and home. They will be at the Royal Bison over the Nov 30 – Dec 2 weekend! 2. 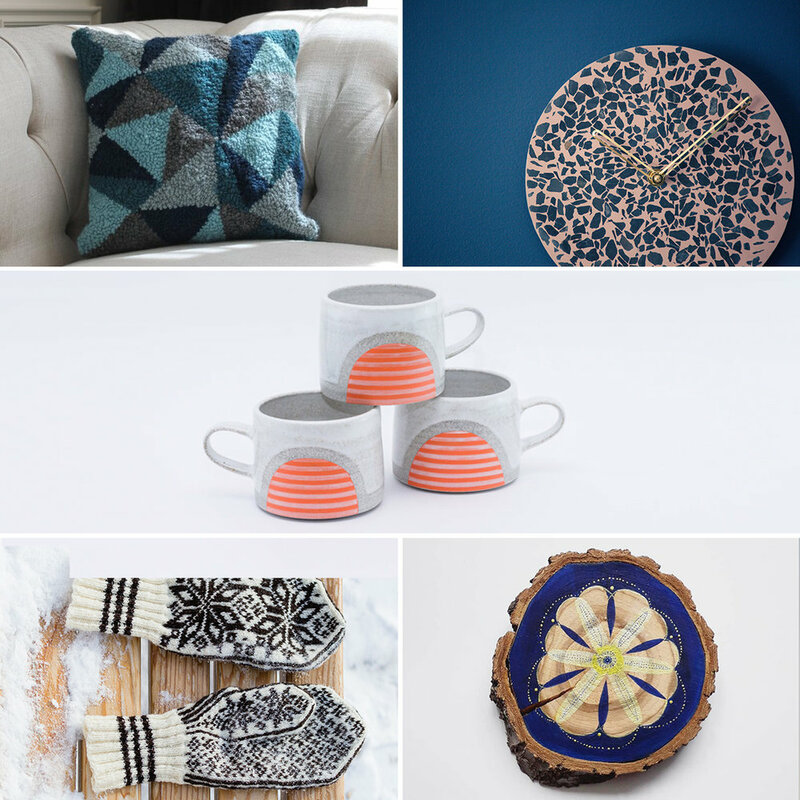 Mezzaluna Studio – designer Vikki Wiercinski will be at both weekends with her mid-century modern tea towels, table runners, stationery, and artwork. 3. BC Ceramic designer, Kalika Bowlby, will be bringing her beautiful pots, bowls, and mugs over the Dec 7-9 weekend! 4. New Edmonton artist vendor, Rachel Sinn has got some fun food and plant prints over the Dec 7-9 weekend! 5. Veteran concrete-artist team, Concrete Cat, has got some nifty new products including donuts and lotus sculptures! Concrete Cat will be at the Royal Bison Nov 30 – Dec 2!